easyJet has recently concluded long term deals with Gatwick and Luton airports, its two largest London bases. The Gatwick deal follows a change in economic regulation that encourages a more tailored approach and the Luton agreement follows a change of concession ownership and a commitment to capacity expansion. Last year, easyJet reached a similar agreement with Stansted, which is no longer subject to economic regulation. easyJet also operates from Southend, the smallest London airport, albeit not under a long term contract. easyJet's London airport deals give it both a high level of visibility over airport charges and real flexibility about where to deploy its capacity. It has thrown an effective lasso around the UK's capital, and now appears to have tightened its grip on the rope. The 10 year deal between easyJet and London Luton Airport envisages the possibility that the LCC could more than double its passenger numbers at the airport from four million to nine million annually. It aims to increase its capacity at Luton by 20% in the first year alone. It currently has 15 aircraft based at Luton and operates 39 routes from the airport. Growth will come from adding new routes, both business and leisure, and from increasing frequencies on some of its current routes. There seem to have been three key, and related, factors in easyJet's decision to sign this deal. First, there are plans in place to expand the airport's capacity to 18 million passengers a year (it served just under 10 million in 2013). The major elements of the plans involve expanding terminal capacity and surface access to the airport. These plans, which are yet to receive formal approval from the Secretary of State for Communities and Local Government, involve use of the existing runway and what easyJet calls "huge improvements to the rest of the airport's infrastructure". While the expansion of Luton Airport has met with some local opposition on environmental grounds, particularly with respect to noise, the deal between easyJet and the airport raises the stakes for the Secretary of State. It now looks harder for the Government to be seen to deny a project that has the commitment of the UK's largest airline and which will bring significant economic benefits. The second factor is that easyJet believes the planned improvements to the airport will lead to a better customer experience. The airline has carefully enhanced its brand in recent years, adding a customer service dimension to its low-cost credentials and this has generated greater passenger loyalty and helped to attract business travellers. Although Luton is home to easyJet's head office and it has a strong historical link with the airport, it is unlikely that the existing management would commit so strongly unless it was convinced that it could continue to provide a sufficient level of service quality. The third and overarching factor in easyJet's decision is the stimulus provided by Luton Airport's new concession owners Ardian and AENA, with whom the carrier's CEO Carolyn McCall said she was "looking forward to working". She added that "their financial investment and long term commitment to developing London Luton were a key factor in our agreeing to this new deal and will help us to deliver our plans". Interestingly, and in contrast to Ryanair's statement concerning its 10 year deal with London Stansted announced last year, easyJet makes no mention of airport charges at Luton. For Ryanair, an improved cost base at Stansted was the most important factor in committing to that airport, but Luton is a lower cost airport than Stansted and all the other London airports. 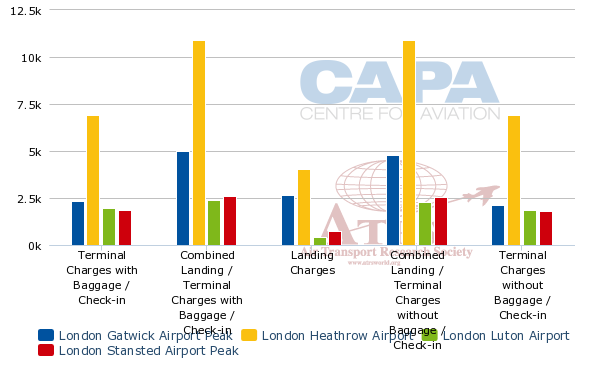 Moreover, airport charges at Luton (as indicated by average aeronautical revenue per passenger) have increased less sharply than at the other London airports. easyJet agreed a deal with Stansted airport in Jun-2013, under which it envisages more than doubling its annual passenger numbers at the airport from 2.8 million to six million over five years. Nevertheless, it seems reasonable to assume that easyJet has received some kind of price incentive from Luton in exchange for its 10 year commitment. If it doubles its passenger numbers over 10 years, while the airport increases from 10 to 18 million passengers, easyJet will increase its share from 45% to around 50%. For the airport, this deal could drive a much more rapid growth rate than has been seen for many years. An increase from 10 to 18 million over 10 years is equivalent to a compound average growth rate of 13%, while the CAGR it has seen over the past eight years has been less than 1%. It has achieved revenue growth at a CAGR of 6% pa, but this has almost entirely been driven by increased airport charges, with some support from higher commercial revenue per passenger. At London Gatwick, which is easyJet's biggest base, the deal is over a seven year term from Apr-2014. The carrier currently has 57 aircraft based there and operates 107 routes. In the first year of the deal, easyJet plans to increase seat capacity at Gatwick by around 10%, although it has not said what its growth targets are over the seven years. It has said that it plans to grow by adding to its slot portfolio at Gatwick (presumably through incremental slot trading rather than another significant acquisition of slots like the deal under which it acquired all of Flybe's Gatwick slots) and by replacing 156 seat A319s with 180 seat A320s. Unlike Luton, Gatwick falls under the Civil Aviation Authority's economic regulation regime. The most recent regulatory settlement went some way towards moving Gatwick from the previous approach of setting a price cap purely on the basis of a target return on the regulatory asset base. The CAA did set an overall "fair price" path limiting price increases to RPI-1.6% annually, but the emphasis is now on a new "commitments" framework. This essentially encourages the airport and the airlines to negotiate their own arrangements for charges and services, with the regulator maintaining a watching brief to ensure that the airport's pricing does not abuse its position of market power. easyJet has been operating at Gatwick since 1999, but this is the first freely negotiated deal between the two parties (thanks to the new regulatory approach). Moreover, it comes when easyJet's share of seats and ATMs is higher than ever. From the start of the northern summer 2014 schedule, when its acquisition of the slots formerly held by Flybe takes effect, easyJet's share of ATMs at Gatwick is 44%. This has increased from 16% in 2007, while the share of number two carrier British Airways has fallen from 26% over the same time period (it has remained fairly stable at around 16% since 2010). easyJet's market share at Gatwick is similar to its share at Luton, but its lead over the number two carrier is greater at Gatwick (Luton's number two carrier Wizz Air has 27% of ATMs in the northern summer 2014 schedule). For easyJet, the move to a lighter touch regulatory regime has coincided perfectly with it attaining its strongest negotiating position at the airport, based on its market share. While details of the pricing of airport charges to easyJet in the new deal are not public, the carrier's press release said that the agreement "will incentivise the airline to grow at the airport". The release also quoted Ms McCall: "This agreement gives easyJet certainty on passenger charges over the next seven years and a clear incentive to continue to grow." This suggests that easyJet is comfortable with the pricing element of the deal. Gatwick is a more expensive airport than Luton and aeronautical revenue per passenger increased by 68% from 2007 to 2012, an increase that was second only to Heathrow (+96% over this period) among the four major London airports. However, easyJet also achieves a higher yield at Gatwick than at Luton and it will remain its main operational base in the UK. "Our shared ambition is for Gatwick to be both our biggest and best airport", said Ms McCall. Just as a pre-requisite for the deal with Luton was the assurance of a suitable level of service quality, so it was important that easyJet was comfortable that Gatwick could and would provide the passenger service it wants. Ms McCall commented that "it will create a framework for easyJet and Gatwick to plan and deliver an improved experience for our passengers". This combination of price incentives, to give easyJet some control over its costs, and service quality assurances at its highest yielding UK airport should allow its growth there to be achieved profitably. For Gatwick, the deal shows that it can work with airlines under the new "commitments" framework in a more cooperative way than was often the case under the old, more adversarial, regulatory regime. It should also give Gatwick better visibility over future traffic development, improving the backdrop for planning investments. Traffic growth at Gatwick has been stagnant in recent years (passenger numbers in 2012/13 were the same as in 2006/07 at 34 million), although it achieved growth of 4.6% in the 12 months to Feb-2014 and the base case forecast in the airport's business plan sees growth at an average of just below 2% pa over the next 10 years. This is a modest forecast, but achieving even this rate would be a significant improvement on the recent past and requires a commitment from the airport's leading carrier easyJet. Furthermore, the 10 year forecasts in Gatwick's business plan would see passenger numbers passing 40 million and approaching the limit of the runway's capacity. Gatwick is keen to secure the recommendation of the Davies Commission as the first choice for new runway capacity in the UK and is on the Commission's shortlist. With this in mind, it is strategically important for Gatwick not only to have a forecast that says it will need new capacity, but also to be able to back up that forecast with credible airline intentions. The new deal with easyJet helps with this aim. Next stop for easyJet, Heathrow? easyJet's presence in all but two (Heathrow and City) of the six London airports uniquely positions it to negotiate over charges and traffic growth plans. CEO Carolyn McCall has even said that easyJet would consider operating from Heathrow "if it was right for us" (The Daily Telegraph, 27-Mar-2014). Given Heathrow's very high charges compared with the other London airports, this seems unlikely in the short term. However, if the new, lighter touch regulatory approach that is now benefiting easyJet at Gatwick were to spread to Heathrow, easyJet could be well placed to negotiate a favourable deal. Deals between airlines and airports give greater pricing certainty to the airlines and greater traffic certainty to the airports, so this could also be of benefit to Heathrow.